The BLM held their latest Dumont Sub-group public meeting over Thanksgiving weekend at the Dumont visitor center. The meeting's objective was to provide the public an opportunity to participate in subgroup discussions related to management of the Dumont Dunes Recreation Area. The Dumont Dunes subgroup discussions and public involvement assists the BLM in managing the recreation area. This was BLM's first attempt at holding the meeting at Dumont. Usually the meetings are held on a Tuesday morning at the Barstow Field office and it is nearly impossible for the public to attend and offer suggestions or ask questions. Over Thanksgiving weekend, a small crowd of duners showed up to the meeting at the visitor center. Some attended to get involved and voice their concerns, others didn't know what to expect and just wanted to be in attendance to see what the meetings were all about. A larger crowd was expected, however this was BLM's first meeting at Dumont and they hope that may change at the next one. For many of those who attended the meeting, it gave them some insight as to how much the BLM actually listens to us duners. As a government agency, sometimes it's easy to overlook what might be a common issue or simple solution to everyday users of Dumont Dunes. Below are some of the topics that were brought up. These items are usually discussed further in detail or resolved at the next meeting. The next sub group meeting will be held on Saturday March 18, 2016 at the same location (visitor center) at Dumont. It was voted: Dumont Clean Up at 8am, Sub-group meeting to follow at 12pm. Please come help keep the dunes clean and then give your concerns a voice. Thanksgiving at Dumont is more than just a holiday weekend. It's a holiday week. Duners started rolling in as early as Sunday in preparation for the big holiday in the sandbox. The early birds were no turkeys for getting there before the crowds. The dunes were still in great shape and offered some great duning and tranquility. As the week went by, the dunes became more and more tracked out, but they were never super busy all at once. Thanksgiving may draw a large crowd, but it is usually spread out. Duners have the the long weekend to play so there is no rush to get out and pound the dunes like you see on weekends like Halloween or President's. There is plenty of time to relax or goof off in camp. By the time Thursday rolled around, the camp area was filling in, but was significantly less people than Halloween weekend. As seen from the dunes above, the Dune Masters and Sandpipers' camp was easy to spot. Every year they are, by far, one of the largest camps out there. Thursday was an extremely mellow day. After all, it was Thanksgiving! Feasts were prepped and turkeys were dropped in the cookers. 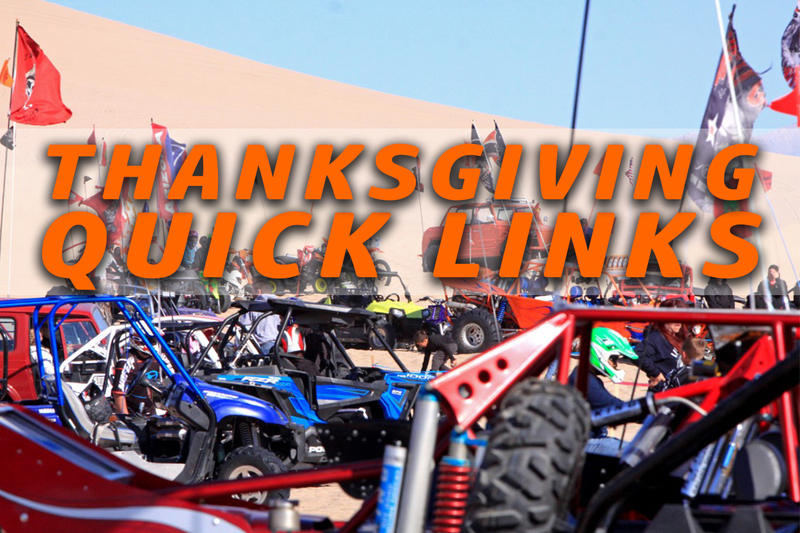 The one thing about Thanksgiving that is unlike any other day at the dunes is the smell. You can literally drive through the camp area and smell all the food cooking. Once it was time to eat, camps sat down together in true Thanksgiving tradition. Those turkey comas didn't stop some duners from having fun though. There were a bunch of duners in the dunes on Friday making for some tracked out dunes. Some chose to avoid the rutted sand by kicking back at Comp Hill to watch the annual waterpumper hill climbs hosted by the DuneMasters and Sandpipers Club. As mentioned earlier, there wasn't quite as much action as Halloween weekend, but there was still that Dumont holiday buzz in the air. It's a wonderful sound. Once the sun went down, the party began. Fireworks and lights lit the camp area up. Saturday's great weather allowed for some more fun in the sun. The waterpumpers drew quite the crowd along the back stretch of sand highway for the sand drags. As the day wound down, the weather kicked up. Someone must have mentioned that W word! Around 5PM, 50-60+ mph gusts came up out of nowhere, whipping through camp forcing duners to retreat to their trailers and RVs. Many people got caught right in the middle of it while they were out in the dunes and at vendor row when it hit. Getting back to camp was a challenge since it was a complete white out! There was almost zero visibility but everyone managed to get back safely one way or another. Then just as quickly as the "W" came, it subsided. It only lasted a few hours. Shortly after 9PM, flags were barely dancing in the breeze. As duners cautiously made their way back outside, they got their campfires built back up to stay warm. Sunday morning was epic. Mother nature had smoothed out the hammered dunes. The skies were blue, but not for long. Partially cloudy skies quickly turned into ominous clouds and the storm made a comeback. And just like that, the beautiful morning turned into another sand storm. That's Dumont for ya! It just goes to chow how quickly the weather can change out there. That's a wrap for Thanksgiving Weekend 2016. Hopefully everyone had a great weekend. Thanks to all of those who submitted the great photos, videos, and updates from your weekend. On Friday around 6:30 AM, a Blackhawk medevac was spotted hovering over Banshee Hill area. It stayed there for about 20-30 minutes before landing near an overturned truck. During the early morning hours on Friday, the truck crashed and landed upside down in the dunes between Banshee Hill and the Superbowl. Around 4:00 A.M. the driver of the Blazer/ Tahoe managed to walk out of the dunes looking for help at the closest camp. He knocked on an RV door for help and those duners warmed him up and asked what was going on. They then rode into the dunes, found the truck and the passenger could not move. 911 was called and a medic helicopter arrived. The passenger was extracted from the vehicle and airlifted out. There were reports of him not being able to feel his lower extremities. 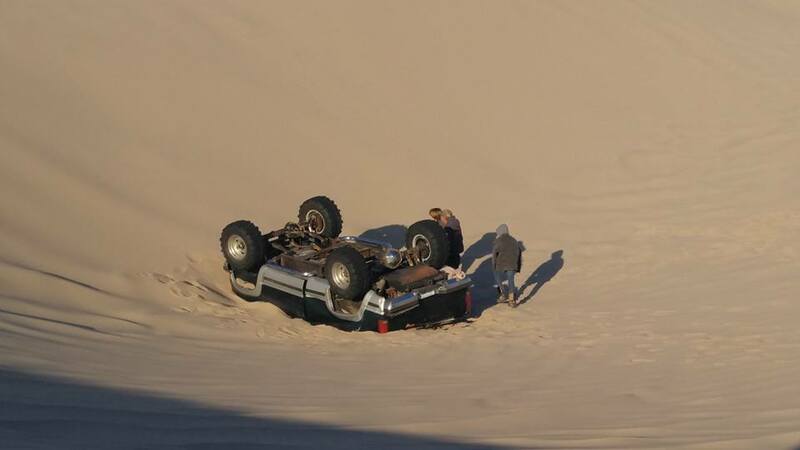 The truck was flipped back over and removed from the dunes. photos by Jodi Knight, Kyle Clark, and Adam Burnham. If you find something out at the dunes and are trying to return it to the owner, the visitor center at the Ranger Station is the best place to drop items off. Weekly holiday passes are available ($40) on site at the machine or through a participating off-site vendor. Season passes are available through Dune Mart on Vendor Row and participating off-site vendors. Download this to your phone and send it to your friends to help find each other's camps. Got a Question? Still Need Help? What is a waterpumper you ask? Back in the 60's and 70's, the only buggies you would see at the dunes were cars that were powered by air cooled engines, typically Volkswagens and Corvairs. When the Dune Masters formed in 1968, they were putting together V8 powered buggies originally built from cut-down car frames. Back then, water cooled engines were new to the scene. They soon took on the name, "waterpumpers". Jerry Miles - a founding member of the Dune Masters club, Whittier, California. 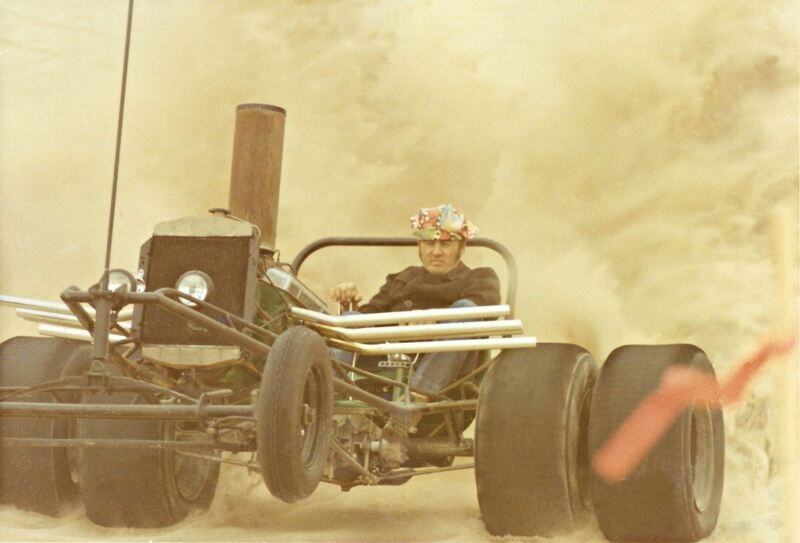 1970 Thanksgiving hill climb competition at Dumont Dunes. Photo courtesy of Bill LeFever. The Dune Masters and Sandpipers Club will be hosting their 48th Annual hill climbs and drags. That's right, 48! The club was founded back in 1968 and they have returned to Dumont every year since then with their V8 powered buggies. They make up a big part of the history of Dumont Dunes so be sure to check them out. They will be set up on the steep, left side of Comp Hill for the hill climbs on Friday and then on Saturday the drags will take place along the back stretch of sand highway where you would drive out to the north pole. 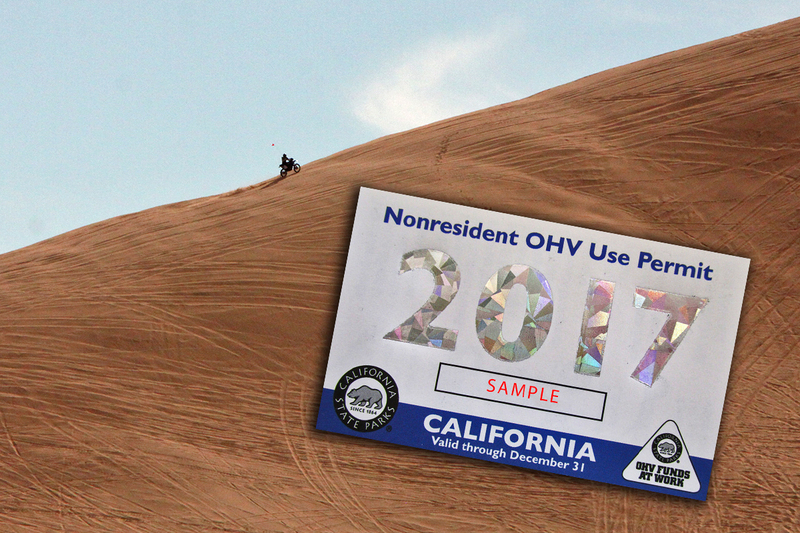 If you are not a resident of California and your OHV is not registered in your home state, you are required to have a "California Non-resident OHV use permit" sticker to legally operate your vehicle at Dumont Dunes. These stickers are required in addition to a weekly or season Dumont Pass. If you need to pick up a sticker for Thanksgiving Weekend, you have a couple options out at Dumont this year. DuneMart, on Vendor Row, has plenty of them in stock and the BLM will also have some at the visitor center. Stickers are $30 and expire on Dec 31st, 2017. 575 W Lake Mead Dr.
*holiday hours may vary. Call vendor to double check. MORENO VALLEY, Calif. – The Dumont Dunes subgroup to the Desert Advisory Council (DAC) will be holding its next meeting on Sat., Nov. 26 at 10:00 a.m. in the Dumont Dunes Off-highway Vehicle (OHV) recreation area near the visitor center. 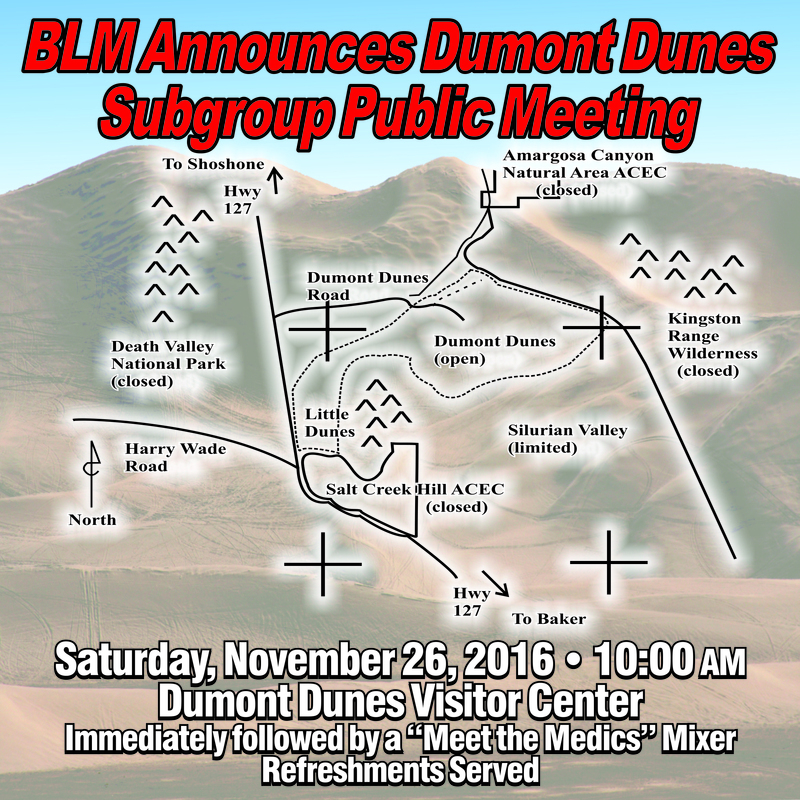 The meeting will provide the public an opportunity to participate in subgroup discussions related to management of the Dumont Dunes Recreation Area. The Dumont Dunes subgroup discussions and public involvement assists the BLM in managing the recreation area. Immediately following the meeting, the BLM Barstow Field Office will host a “Meet the Medics” event at the medical compound on-site. 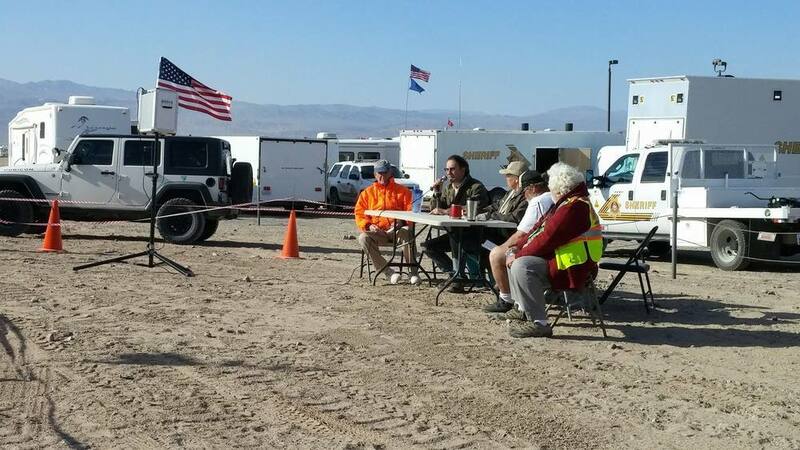 The public is invited to have coffee, hot chocolate and snacks with the medical response staff assigned to the Dumont Dunes Recreation Area. Representation on the subgroup consists of California OHV interests, Nevada OHV interests, OHV organizations, San Bernardino County, biological sciences and local communities. If individuals are unable to attend, but would like to provide comments regarding Dumont Dunes, please contact Katrina Symons, Field Manager, Barstow Field Office, 2601 Barstow Rd, Barstow, CA 92311, 760-252-6000, ksymons@blm.gov. Thanksgiving is the day of giving thanks for everything we are blessed with in our lives. It’s the time of year when us duners take a few days, hit the sandbox and enjoy it with our friends and family. In order to keep with the Thanksgiving Day tradition, we get creative and cook our feasts out of our RV's at Dumont. Some deep fry their turkeys, others use methods like infrared cookers or deep pit style. The dunes are our home and we wouldn't have it any other way. It's one of the longest holiday weekends of the year, therefore some sand-fanatics who live farther than most regulars make this their one big trip of the season. Others come out early and enjoy a whole week in the sandbox. In true Thanksgiving tradition, the waterpumpers return to Dumont! The Dune Masters and Sandpipers Club will be hosting their 48th Annual hill climbs and drags. That's right, 48! The club was founded back in 1968 and they have returned to Dumont every year since then with their V8 powered buggies. 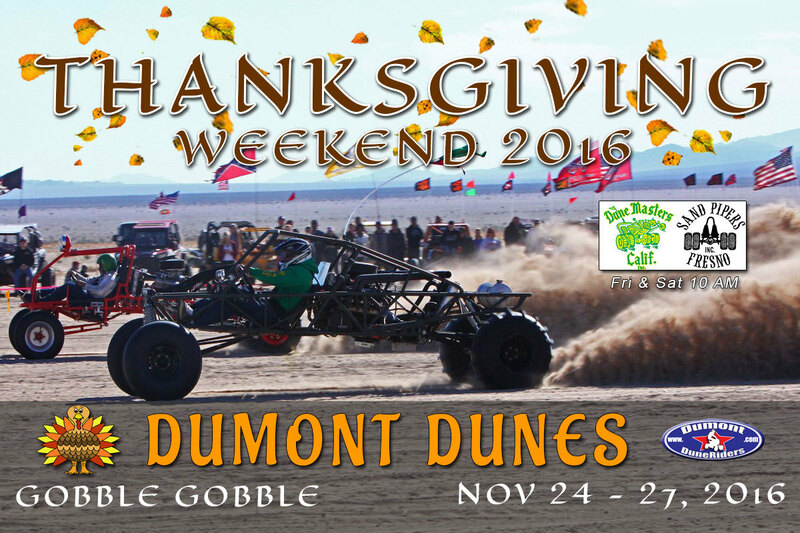 They make up a big part of the history of Dumont Dunes so be sure to check them out. They will be set up on the steep, left side of Comp Hill for the hill climbs on Friday and then on Saturday the drags will take place along the back stretch of sand highway, where you would drive out to the north pole. Good times are here again! Dune season kicked off Halloween weekend bringing back the energy of the pre-recession days of Dumont Dunes. Let's face it. Some of the holiday weekends over the past 5-6 years have been rather stale and low on attendance. This year seemed a bit different though. There was an added element of vitality and excitement in the air. This recent boom may have been sparked by the side x side craze. Back in the day, duners would acquire big ticket sand toys by using their home equity. Nowadays, companies like Polaris and Can Am make it easy to finance a toy that the whole family can enjoy year round. Whether this is what reignited the spark or not, Halloween weekend definitely had a huge crowd as shown from duner, Chad Lozier’s, high flying drone. The BLM recorded 16,000 duners were in attendance. As if that didn't give us a good enough perspective, paragliders, Bill Baby and Ryan Thomas, flew overhead capturing the view from their own bird's eye view. Talk about the best seat in the house! Vendor Row was lacking a few vendors this year compared to other years, however duners still got over there as early as Friday morning to cash in on early weekend deals and to get some dune shopping in. Beefy Boys BBQ served up breakfast, lunch and dinner while California Casuals offered their famous holiday weekend t-shirts that almost every duner has owned at some point. The weather was overcast a good portion of the weekend, but the sun managed to break through the clouds making for some much needed A/C time in the RV. Temperatures were warm all weekend ranging from the low 70's after the sun went down to 93 degrees on Saturday afternoon! It was shorts weather all day and into the night. Campfires weren't even fired up until late. Speaking of weather, the recent rain that hit Dumont that Monday and Tuesday before Halloween weekend made for some choppy sand conditions. The dunes were already tracked and rutted out as early as Friday morning. So much for a smooth dune run before the crowds rolled in! That sand was wet underneath all weekend. It didn't stop everyone from having fun though. Just getting back to the sandbox after a long summer was good enough. The BLM opened their doors to the visitor center. Park Ranger Art provided safety and wildlife information and let duners pet the lizards and snakes that were on display. Rangers and medical staff were ready and responded to a few accidents throughout the weekend. One fatality was reported when a Banshee rider was unable to stop at the top of Banshee Hill. Full story here. Once the sun went down on Saturday it was Trick-or-Treat time! Little duners and even some of the parents got into costume and went camp to camp for candy. Dumont is arguably the best way to spend Halloween for kids and adults. Duners decorated their camps and really got into the spirit out there as always. This year we saw the Star Wars crew, dinosaurs, nuns, pimps, and lots of Donald Trumps! Comp Hill was literally lit up with lighted whips that stretched 5+ rows back. Drones were flying around with ghosts hanging from them, the Star Wars Landspeeder was making it's rounds passing out candy and taking pictures with everyone, and there was the loudest stereo system in the world blasting music from the front row into the crowd. That's not all. People were actually racing this year too. Imagine that...racing at Competition Hill. Let's not forget the famous McFlurry. It was in tow up and down the aisles as people cheered it on. Sunday morning started as another overcast day. The sun came out for a minute, then out of nowhere there were 30+ mph winds blowing sand and dust so hard that it was impossible to see across the camp area. It came at an unfortunate time for duners as most were just getting packed up. Some of the people who were camped in tents faced even more of a challenge. The wind turned their dune home into a hang glider! As we all know, this "W" word is what makes Dumont so awful and great at the same time. It can ruin our day of duning but at the same time fix the place right back up after a busy weekend. Come Monday, the dunes were back to how we love them, nice and smooth. It's only a few weeks away. Start getting those dune toys ready now because it will be here before you know it. On Saturday 10/29/2016 around 11:30 am, Gustavo Aranda Castaneda a 32 year-old resident of Riverside, CA was riding his Banshee up Banshee Hill at Dumont Dunes. He wasn't able to stop before reaching the top and rode off of a 60-70 foot dropoff. Gustavo, also known as "Gus", was wearing a helmet and was ejected from the quad. Medics arrived and performed CPR, but unfortunately he did not make it. He was pronounced dead on scene at 12:43 pm. The California Highway Patrol is investigating the incident. We extend our condolences to the family and friends of Gus. "Gus leaves behind his bereaved wife, Daisy Aranda of 26 years old, two children Nathan and Isaac & a loving extended family. The Aranda family had plans to vacation this upcoming week but is now suffering at the loss of their loved one. Gus was a hardworking man (Vons Store), funny, caring and was always willing to help others. He loved his children and wife with such passion and would have gone above and beyond for them. This sudden loss has brought much heartache to the family. The family was unprepared for this incident and is asking for contributions to fund a beautiful memorial ceremony for Gustavo Aranda-Castaneda. He will be forever remembered as a wonderful father, husband, friend, son, and confident. Gus, you made it home! Wait for us, we’ll see you soon! We love you Gus! Thank you all for your support and prayers. God Bless!" 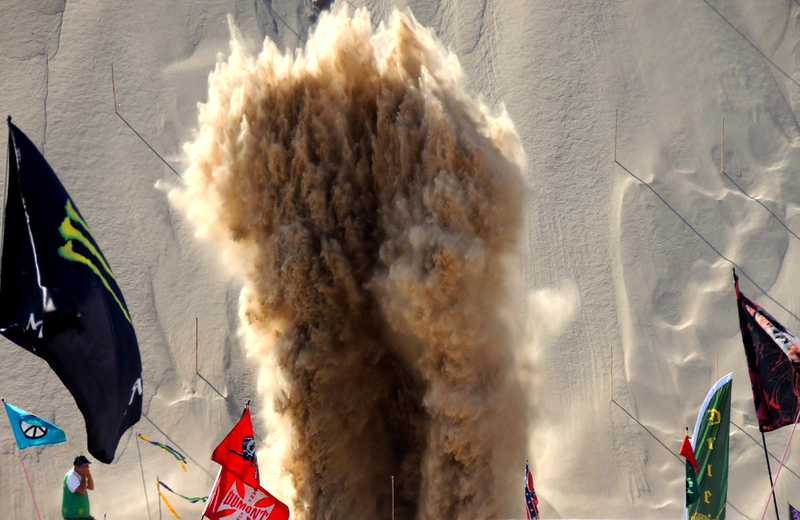 Duners were blown away with what rolled into Dumont Dunes this year for Halloween Weekend! Star Wars characters Darth Vader, Luke Skywalker, Chewbacca and Princess Leia pulled up to Comp Hill in the Landspeeder X-34. Cel phones and cameras couldn’t come out quick enough. Everyone surrounded the homemade creation and were in awe at how far these guys got into the Halloween spirit. The Landspeeder drove up and down the rows at Comp Saturday night playing the Star Wars music and handing out candy to everyone. Between the music, the costumes, and lightsaber swords, the force was strong with this crew! Duners loved it and thanked them for their hard work and dedication. Once again, Howard, Trish, Walter and Laura, of Las Vegas, wowed Dumont beyond everyone's expectations. 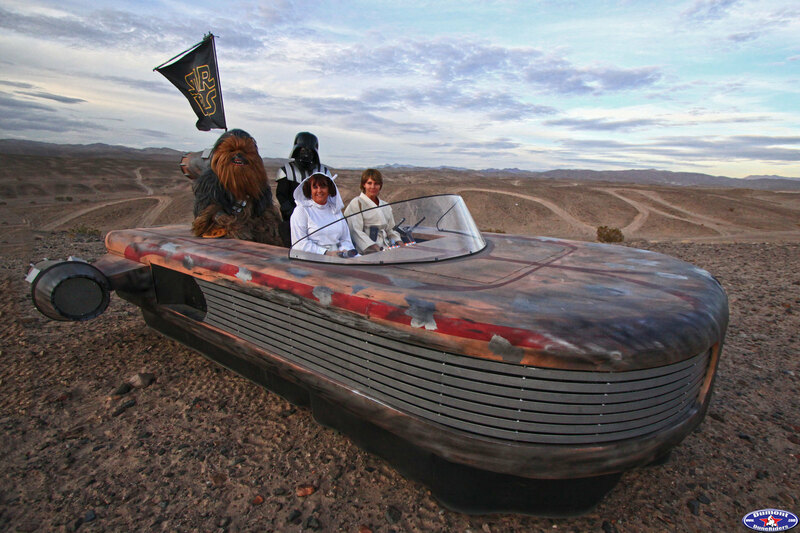 The Story Behind the Star Wars Landspeeder RZR Halloween weekend at Dumont is one of the most festive weekends of the year. For some people, it’s a fun excuse to throw on a funny wig or go as far as wearing full costume or string some orange lights up on their rig. Some choose to take things to a completely different level though. Meet Howard and Walter of Las Vegas, NV. You may remember their past Halloween RZR creations such as the Kia commercial hamster-car or the Flintstones mobile. Each year they’ve lifted their creations off the RZR chassis and hung on to them in Howard’s shop. They made such an impression at Dumont and on the internet with these builds that they felt like they had to take it up a notch this year. I think they succeeded in doing that, don’t you? After the Flintstone's car, the bar had to be raised even further. Howard's wife, Trish, came up with the Star Wars theme idea and from there the build was in full force. Since Star Wars is so hot (especially lately), they completely converted their same 2015 RZR XP 1000 into the easily recognized Landspeeder. A photo of the Landspeeder was printed up as a reference for the build, taped to the workbench, and work began! They started with the same bone stock, 4 seat RZR 1000 that was used for the previous builds. They built a skeleton frame around the outside to make up the overall shape of the Landspeeder then added sheet metal to form the body. Most people would probably stop there. Actually, most people would never even go that far in the first place! They then refined the body with bondo, paint, and added fully functioning jets. Many hours went into shaping the body and getting the paint just right. They didn’t skimp on the details. For example, they added the authentic dent in the front and even went as far as building a custom Star Wars Landspeeder style steering wheel, windshield and dash with functioning lights and controls. Even though they had this thing looking identical to the X-34 Landspeeder, that was not enough. Presentation is key! So in addition to the smoking, LED-lit jets, they added an outdoor sound system to blast the Star Wars theme songs. The seats were raised in order to show off their elaborate Darth Vader, Chewbacca, Luke Skywalker and Princess Leia costumes. Hundreds of hours went into this project and they managed to pull it off in just a few weeks leading up to Halloween Weekend. Howard, Walter, Trish and Laura have blown away the community once again and outdone themselves. Any idea what they might have in store for next year? Suggestions?